All boaters in Alabama need a boating license to operate a vessel on state waters. The BoaterExam Alabama Boating Safety course & Boat License Test meets this requirement and allows boaters to get certified on the Internet. Boating safety legislation is expected to reduce the occurrence of boating-related fatalities. Every boater out on Alabama's waters must carry an Alabama Vessel Operator's License, also commonly known as the Alabama Boat License or Boating License. 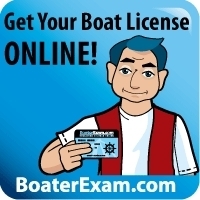 BoaterExam.com, industry leader in boating safety education, offers an online boating safety course and 60-question boat license test that meets the state's education requirement. Mandatory boater safety education is expected to reduce the number of boating accidents and fatalities. "Educated boaters are safer boaters," says Kerry Moher, V.P. of Business Development with BoaterExam.com, "and we commend Alabama for implementing mandatory boater safety education laws. More operators with a boat license mean safer waters in Alabama." In an attempt to target all learning styles, the Alabama Boating Safety Study Guide is fully narrated, contains interactive flash-based exercises, over 150 animated boating safety videos, and visuals in every boat license test question. "Students love that they can sit back and learn about safe boating in an interactive environment," says Moher, "the course engages students of all ages, and visual learners can't imagine taking the boat license test without our visual exam questions." The online boating course is available to anyone as a free study tool. After passing the Alabama Boat License Test Online, students pay a one-time fee of $29.95 for the course. "Alabama is one of those few states where we can't issue temporary licenses, so we advise boaters to take the online test as soon as possible." The boating safety course completion certificate is usually mailed to the student's home within 1-2 weeks. Students then go to a DPS driver's license examiner's office to have a "vessel" class added to the driver's license. The Alabama boat license is good for life and is automatically renewed with the driver's license. They are also valid in most other states that require boater safety education. Anyone who does not have an Alabama driver's license is issued a "vessel only" license by the Alabama Department of Public Safety. BoaterExam: "Look" BoaterExam: "Listen" BoaterExam: "Learn" BoaterExam: "Play"